Conflict may occur between people or within groups in all kinds of situations. Due to the wide range of differences among people, the lack of conflict may signal the absence of effective interaction. Conflict should not be considered good or bad, rather it may be viewed as a necessity to help build meaningful relationships between people and groups. The means and how the conflict is handled will determine whether it is productive or devastating. Conflict has a potential to create positive opportunities and advancement towards a common goal, however, conflict can also devastate relationships and lead to negative outcomes ((Kazimoto, 2013; Fisher, 2000; Evans, 2013). Today’s healthcare leaders are taught to lead change, development, and transformation in organizations. Leadership may be described as the ability to emphasize the pursuit of goals and motivate others to pursue them as well. Northouse states that leadership is a process whereby an individual influences a group of individuals to achieve a common goal (Northouse, 2016). Others characterize leadership as the ability to inspire trust, build relationships, encourage followers. An under-reported aspect that is not commonly discussed among leadership qualities is the ability to handle conflict (Guttman, 2004). Guttman explains that there might be two reasons as to why there is little recognition of conflict management in leaders. One is called rationalistic fallacy, and Guttman explains that most of the literature available focuses on arming leaders with all necessary leadership concepts and success will just follow, almost as if it is assumed that leaders will automatically know how to manage conflict. Secondly, Guttman explains that leaders may have a fatalistic attitude towards conflict. Leaders may look at conflict as situation that will never be resolved, so why bother addressing it? We should focus on what can be addressed and changed (Guttman, 2004). Conflict management is a skill that leaders must be able to employ when needed to help foster a productive working environment (Guttman, 2004). There is a realization that conflict management should be a skill that leaders need to give priority to learning and mastering (Kazimoto, 2013). The inability of a leader to deal with conflict will not only lead to negative outcomes but may also undermine the credibility of the leader (Kazimoto, 2013). Whereas if a leader is able to establish an atmosphere of cooperation and foster teamwork, making it clear that this is his/her value system, there is a likelihood that this value system will be adopted by the entire organization (Guttman, 2004). Therefore, it is very important that we discuss and address conflict management as a leadership skill. This chapter will discuss the definition of conflict and its sources, describe conflict management and resolution, and discuss a guide for leaders to use to help them effectively manage and resolve conflict. We discuss the different types of conflict that can exist and describe the different conflict management modes that can be used to address them. Lastly, we will analyze the relationship between leadership and conflict management through a literature review. By reading this chapter, I hope that readers will understand conflict, the role it plays within teams and organizations, and the importance of developing conflict management skills for leaders. What is conflict? The answer to this question varies, depending on the source. The Webster Dictionary defines conflict as “the competitive or opposing action of incompatibles: an antagonistic state or action.” For some, the definition of conflict may involve war, military fight, or political dispute. For others, conflict involves a disagreement that arises when two or more people or parties pursue a common goal. Conflict means different things to different people, making it very difficult to come up with a universal or true definition. To complicate this even further, when one party may feel that they are in a conflict situation, the other party may think that they are just in a simple discussion about differing opinions (Fisher, 2000; Evans, 2013; Conflict, 2011). Economic Conflict involves competing motives to attain scarce resources. This type of conflict typically occurs when behavior and emotions of each party are aimed at increasing their own gain. Each party involved may come into conflict as a result of them trying to attain the most of these resources. An example of this is when union and management conflict on how to divide and distribute company funds (Fisher, 2000; Evans, 2013). Value Conflict involves incompatibility in the ways of life. This type of conflict includes the different preferences and ideologies that people may have as their principles. This type of conflict is very difficult to resolve because the differences are belief-based and not fact-based. An example of this is demonstrated in international war in which each side asserts its own set of beliefs (Fisher, 2000; Evans, 2013). Power Conflict occurs when each party tries to exert and maintain its maximum influence in the relationship and social setting. For one party to have influence over the other, one party must be stronger (in terms of influence) than the other. This will result in a power struggle that may end in winning, losing, or a deadlock with continuous tension between both parties. This type of conflict may occur between individuals, groups, or nations. This conflict will come into play when one party chooses to take a power approach to the relationship. The key word here is “chooses.” The power conflict is a choice that is made by one party to exert its influence on the other. It is also important to note that power may enter all types of conflict since the parties are trying to control each other (Fisher, 2000; Evans, 2013). According to Ana Shetach, an organizational consultant in team process and development, conflict can be a result from every aspect such as attitude, race, gender, looks, education, opinions, feelings, religion and cultures. Conflict may also arise from differences in values, affiliations, roles, positions, and status. Even though it seems that there is a vast array of sources for conflict, most conflict is not of a pure type and typically is a mixture of several sources (Shetach, 2012). Conflict is an inevitable part of life and occurs naturally during our daily activities. There will always be differences of opinions or disagreements between individuals and/or groups. Conflict is a basic part of the human experience and can influence our actions or decisions in one way or another. It should not be viewed as an action that always results in negative outcomes but instead as an opportunity for learning and growth which may lead to positive outcomes. We can reach positive outcomes through effective conflict management and resolution, which will be discussed in more detail later in the chapter (Evans, 2013). Based on this report, we can conclude that conflict can lead to positive outcomes and increased productivity, depending on the conflict itself (Loehr, 2017a). Approximately 76% of the respondents reported that conflict resulted in some type of positive outcome. This speaks volumes to the ideology that conflict within the workplace is something that should be welcomed and not avoided (CPP Global Human Capital Report, 2008). Conflict can occur in various ways in the human experience, whether it is within one-self between differing ideas or between people. Even though this chapter will focus on the conflict at the social level, it is important that we review all the different levels of conflict that may exist. The levels of conflict that we will discuss include interpersonal, intrapersonal, intergroup, and intragroup conflict (Loehr, 2017a; Fisher, 2000; Evans, 2013). Interpersonal Conflict. This level of conflict occurs when two individuals have differing goals or approaches in their relationship. Each individual has their own type of personality, and because of this, there will always be differences in choices and opinions. Compromise is necessary for managing this type of conflict and can eventually help lead to personal growth and developing relationships with others. If interpersonal conflict is not addressed, it can become destructive to the point where a mediator (leader) may be needed (Loehr, 2017a; Fisher, 2000; Evans, 2013). Intrapersonal Conflict. This level of conflict occurs within an individual and takes place within the person’s mind. This is a physiological type of conflict that can involve thoughts and emotions, desires, values, and principles. This type of conflict can be difficult to resolve if the individual has trouble interpreting their own inner battles. It may lead to symptoms that can become physically apparent, such as anxiety, restlessness, or even depression. This level of conflict can create other levels of conflict if the individual is unable to come to a resolution on their own. An individual who is unable to come to terms on their own inner conflicts may allow this to affect their relationships with other individuals and therefore create interpersonal conflict. Typically, it is best for an individual dealing with intrapersonal conflict to communicate with others who may help them resolve their conflict and help relieve them of the situation (Loehr, 2017a; Fisher, 2000; Evans, 2013). Intergroup Conflict. This level of conflict occurs when two different groups or teams within the same organization have a disagreement. This may be a result of competition for resources, differences in goals or interests, or even threats to group identity. This type of conflict can be very destructive and escalate very quickly if not resolved effectively. This can ultimately lead to high costs for the organization. On the other hand, intergroup conflict can lead to remarkable progress towards a positive outcome for the organization if it is managed appropriately (Loehr, 2017a; Fisher, 2000; Evans, 2013). Intragroup Conflict. This level of conflict can occur between two individuals who are within the same group or team. Similar to interpersonal conflict, disagreements between team members typically are a result of different personalities. Within a team, conflict can be very beneficial as it can lead to progress to accomplishing team objectives and goals. However, if intragroup conflict is not managed correctly, it can disrupt the harmony of the entire team and result in slowed productivity (Loehr, 2017a; Fisher, 2000; Evans, 2013). Regardless of the level of conflict that takes place, there are several methods that can be employed to help manage conflicts. And with the seemingly infinite triggers for conflict, management of conflict is a constant challenge for leaders. To help address this, we will next discuss what conflict management is and then later examine the role of leadership in conflict management and resolution. Conflict Management may be defined as the process of reducing negative outcomes of conflict while increasing the positive. Effectively managed conflicts can lead to a resolution that will result in positive outcomes and productivity for the team and/or organization (Loehr, 2017b; Evans, 2013). Leaders need to be able to manage conflict when it occurs, and their ability to manage them is critical to the success of the individuals and/or teams involved (Guttman, 2004). There are several models available for leaders to use when determining their conflict management behavior. So where do leaders begin when they want to recognize their own conflict management styles? In this section, we will cover a popular method of conflict management styles, the Thomas-Kilmann Conflict Mode Instrument, that will help us answer this question (Loehr, 2017b; Evans, 2013). The Thomas-Kilmann Conflict Mode Instrument is an assessment tool that helps measure an individual’s behavior in conflict situations. The assessment takes less than 15 minutes to complete and provides feedback to an individual about how effectively they can use five different conflict-handling modes. TKI helps leaders understand how individual or team dynamics are affected by each of the modes, as well as helping leaders decide on which mode to employ in different conflict situations (Kilmann & Thomas, n.d.). The TKI is based on two dimensions of behavior that help characterize the five different conflict-handling modes. The first dimension is assertiveness, and this describes the extent to which a person will try to fulfill their own concerns. The second is cooperativeness, and this describes the extent to which a person will try to fulfil others’ concerns. 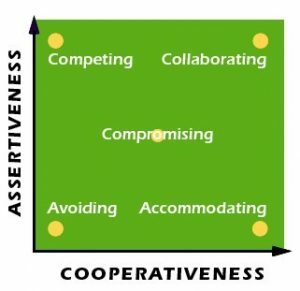 The five conflict-handling modes fall within a scale of assertiveness and cooperativeness as shown in the figure below. They include: avoiding, accommodating, competing, collaborating, and compromising (Loehr, 2017b; Kilmann & Thomas, n.d.). This mode is low assertiveness and low cooperative. The leader withdraws from the conflict, and therefore no one wins. They do not pursue their own concerns nor the concerns of others. The leader may deal with the conflict in a passive attitude in hopes that the situation just “resolves itself.” In many cases, avoiding conflict may be effective and beneficial, but on the other hand, it prevents the matter from being resolved and can lead to larger issues. Situations when this mode is useful include: when emotions are elevated and everyone involved needs time to calm down so that productive discussions can take place, the issue is of low importance, the team is able to resolve the conflict without participation from leadership, there are more important matters that need to be addressed, and the benefit of avoiding the conflict outweighs the benefit of addressing it. This mode should not be used when the conflict needs to be resolved in a timely manner and when the reason for ignoring the conflict is just that (Loehr, 2017a; Mediate.com; Kilmann & Thomas, n.d.). This mode is low assertiveness and high cooperation. The leader ignores their own concerns in order to fulfill the concerns of others. They are willing to sacrifice their own needs to “keep the peace” within the team. Therefore, the leader loses and the other person or party wins. This mode can be effective, as it can yield an immediate solution to the issue but may also reveal the leader as a “doormat” who will accommodate to anyone who causes conflict. Situations when this mode is useful include: when an individual realizes they are wrong and accepts a better solution, when the issue is more important to the other person or party which can be seen as a good gesture and builds social credits for future use, when damage may result if the leader continues to push their own agenda, when a leader wants to allow the team to develop and learn from their own mistakes, and when harmony needs to be maintained to avoid trouble within the team. This mode should not be used when the outcome is critical to the success of the team and when safety is an absolute necessity to the resolution of the conflict (Loehr, 2017b; Mediate.com; Kilmann & Thomas, n.d.). This mode is high assertiveness and low cooperation. The leader fulfills their own concerns at the expense of others. The leader uses any appropriate power they have to win the conflict. This is a powerful and effective conflict-handling mode and can be appropriate and necessary in certain situations. The misuse of this mode can lead to new conflict; therefore, leaders who use this conflict-handling mode need to be mindful of this possibility so that they are able to reach a productive resolution. Situations when this mode is useful include: an immediate decision is needed, an outcome is critical and cannot be compromised, strong leadership needs to be demonstrated, unpopular actions are needed, when company or organizational welfare is at stake, and when self-interests need to be protected. This mode should be avoided when: relationships are strained and may lead to retaliation, the outcome is not very important to the leader, it may result in weakened support and commitment from followers, and when the leader is not very knowledgeable of the situation (Loehr, 2017b; Mediate.com; Kilmann & Thomas, n.d.). This mode is high assertiveness and high cooperation. In this mode both individuals or teams win the conflict. The leader works with the team to ensure that a resolution is met that fulfills both of their concerns. This mode will require a lot of time, energy and resources to identify the underlying needs of each party. This mode is often described as “putting an idea on top of an idea on top of an idea” to help develop the best resolution to a conflict that will satisfy all parties involved. The best resolution in this mode is typically a solution to the conflict that would not have been produced by a single individual. Many leaders encourage collaboration because not only can it lead to positive outcomes, but more importantly it can result in stronger team structure and creativity. Situations when this mode is useful include: the concerns of parties involved are too important to be compromised, to identify and resolve feelings that have been interfering with team dynamics, improve team structure and commitment, to merge ideas from individuals with different viewpoints on a situation, and when the objective is to learn. This mode should be avoided in situations where time, energy and resources are limited, a quick and vital decision needs to be made, and the conflict itself is not worth the time and effort (Loehr, 2017b; Mediate.com; Kilmann & Thomas, n.d.). This mode is moderate assertiveness and moderate cooperative. It is often described as “giving up more than one would want” to allow for each individual to have their concerns partially fulfilled. This can be viewed as a situation where neither person wins or losses, but rather as an acceptable solution that is reached by either splitting the difference between the two positions, trading concerns, or seeking a middle ground. Leaders who use this conflict-handling mode may be able to produce acceptable outcomes but may put themselves in a situation where team members will take advantage of the them. This can be a result of the team knowing that their leader will compromise during negotiations. Compromising can also lead to a less optimal outcome because less effort is needed to use this mode. Situations when this mode is effective include: a temporary and/or quick decision to a complex issue is needed, the welfare of the organization will benefit from the compromise of both parties, both parties are of equal power and rank, when other modes of conflict-handling are not working, and when the goals are moderately important and not worth the time and effort. This mode should be avoided when partial satisfaction of each party’s concerns may lead to propagation of the issue or when a leader recognizes that their team is taking advantage of their compromising style (Loehr, 2017b; Mediate.com; Kilmann & Thomas, n.d.). I chose the TKC Instrument because I felt it encompassed all aspects of conflict behavior and does a thorough job of explaining those behaviors. When compared to other models, the TKI model is more specific in the description of conflict behaviors as well. The TKI model has been around for well over 30 years, and I feel it does a very good job of breaking down a complex theory of conflict styles into a format that is easily understood and can be used by anyone. Leaders should be capable of using all five conflict-handling modes and should not limit themselves to using only one mode during times of conflict (Loehr, 2017b). Leaders must be able to adapt to different conflict situations and recognize which type of conflict-handling mode is best to employ given the conflict at hand (Mediate.com). The use of these modes can result in positive or negative resolutions and it is imperative that today’s leaders understand how to effectively employ them (Loehr, 2017b; Mediate.com; Kilmann & Thomas, n.d.). The leader’s role in managing conflict can have a significant impact on how they are resolved within the workplace or organization. Leaders spend about 24% of their time resolving conflicts, however the process to approaching conflict management relates to a great extent to their leadership style (Guttman, 2004). Leaders who use conflict management skills can provide guidance and direction towards conflict resolution. A common trait of leaders is they are able to build teams that work well together and help to set the tone for the organization. They must be able to facilitate the resolution of conflicts through effective conflict management (Guttman, 2004; Doucet, Poitras & Chenevert, 2009). Leaders exhibit a variety of characteristics and traits that allow them to be great leaders, but does it help them when it comes to conflict management? I believe that it does. These same traits can help leaders dealt with conflict. The ability to recognize one’s own leadership style will ultimately help describe how a leader handles conflict. Peter Northouse states that “it is up to the leader to assess what action, if any, is needed and then intervene with the specific leadership function to meet the demand of the situation.” To be an effective leader, one needs to respond with the action that is required of the situation” (Northouse, 2016). I feel this demonstrates that the job of a leader is to analyze a conflict and facilitate the situation to produce a resolution that can be positive and productive. Northouse reassures us that any leader can draw on his/her leadership skills to employ appropriate conflict management strategies (Northouse, 2016). A study conducted by Zhang et al. analyzed the relationship between transformational leadership and conflict management. Zhang et al. looked at how transformational leadership affects team coordination and performance through conflict management. What they found was that transformational leaders who used conflict management methods were able influence their teams to establish stronger identities, discuss their disagreements and frustrations outwardly, and work out solutions that benefited the team (Zhang, Cao, Tjosvold, 2011). I feel that this study helps to confirm that leaders must be able to possess conflict management skills to effectively run a productive team and organization. This study also shows us that there may be a possibility that certain leadership styles are more effective at conflict management. This is not definite but hopefully there will be more studies done to determine this. Effective leaders know how to bring conflict situations out into the open so that all parties involved can begin to work towards a resolution that will benefit everyone. They manage conflicts in way that it is seen as an opportunity to build productive relationships (Guttman, 2004; Kazimoto, 2013). The means in which conflict is managed will determine whether the outcome will be positive and productive, or negative and destructive. Leaders are taught to lead change, development, and transformation in organizations. One way leaders can accomplish their goals is through effective conflict management. Conflict can be described as a disagreement among two parties that is usually portrayed as antagonism or hostility. Conflict can arise from three different sources: economic, value, and power conflicts. Conflict can also occur at different levels of the human experience, which include: interpersonal, intrapersonal, intergroup, and intragroup conflict levels. Conflict management is the process of reducing negative outcomes while increasing the positive. Leaders must be able to utilize conflict management skills to provide direction and guidance towards a resolution. Leaders can use the Thomas-Kilmann Conflict Mode Instrument to help them recognize and understand their own conflict handling modes. The TKI model also helps leaders understand which conflict handling modes are most appropriate for each particular conflict situation. Zhang et al. shows us that transformational leaders are able to effectively influence their teams to workout solutions to their conflicts. This shows us that transformational leaders are able to utilize conflict management effectively. Peter Northouse also tells us that an effective leader needs to be able to respond to a situation with an action that is required of that particular situation. Therefore, leaders must be able draw on their leadership skills to effectively employ conflict management strategies. Conflict is certain to occur regardless of the setting and individuals involved. For conflict to result in a positive outcome, leaders and teams must recognize that conflict not only exists but is a necessity. Understanding conflict allows leaders to manage it more effectively and can provide a path to accomplishing positive outcomes. Conflict management can be an active force that will allow leaders grow healthy relationships within their organizations which can ultimately result in effective productivity. Conflict management must be a part of a leader’s toolbox and be deployed when conflict arises within a team or organization. If conflict is not addressed in a timely manner, it can not only affect the moral of the team/organization but can create larger issues later. Once this happens it may be more difficult to resolve then it would have been if the conflict was addressed immediately and effectively. Leaders must be able to recognize that conflict can cause negative issues within their team or organization. If they are able to pull on their leadership skills and recognize which conflict-handling mode is required for each situation, they can create an opportunity to improve team structure and dynamics, and ultimately achieve their goal of changing, developing, and transforming organizations. Leadership in Healthcare and Public Health by Fadi Smiley is licensed under a Creative Commons Attribution 4.0 International License, except where otherwise noted.